Hyperhomocysteinemia: How Does it Affect the Development of Cardiovascular Disease? © 2018 Lopes CI. This is an open-access article distributed under the terms of the Creative Commons Attribution License, which permits unrestricted use, distribution, and reproduction in any medium, provided the original author and source are credited. Homocysteine is an amino acid with an SH group, metabolised by the remethylation and transsulfuration pathways. Several genetic and environmental factors (like deficient nutrition status, systemic disease or consumption of certain drugs), can lead to changes in the levels of plasma homocysteine. Nowadays, hyperhomocysteinemia is considered an important and independent risk factor for atherosclerosis and cardiovascular disease. 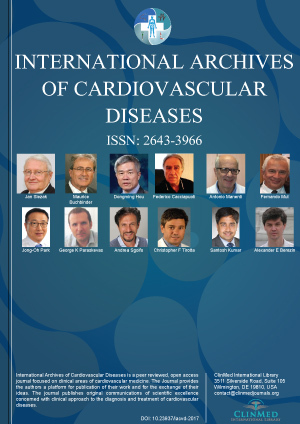 Several pathological mechanisms have been proposed for the effect of hyperhomocysteinemia in the development of cardiovascular disease. Among them are DNA methylation, decreased protein S-nitrosylation, production of reactive oxidative species and decrease in nitric oxide formation. Main strategies being tested for the treatment of this condition involve supplementation of folic acid, vitamins B6, B12 or riboflavin. From these, increased plasma folic acid levels by folate-rich diet or pharmacological supplementation seems to be the most effective. Inês Lopes Cardoso, Health Sciences Faculty, Fernando Pessoa University, Rua Carlos da Maia, 296, 4200-150 Porto, Portugal, Tel: 351-225071300.